During robotic heart surgery, surgeons use a computer-enhanced tool called the da Vinci® Surgical System to perform complicated procedures through small incisions. By embracing robotic innovation in minimally invasive heart surgery, Montefiore-Einstein strengthens its commitment to return patients to their active lives quickly. How is Robotic Heart Surgery Performed? Before surgery begins, the surgeon makes three pinky-sized incisions between the patient's ribs. The first incision is made for a camera that provides the surgeon with a clear, three-dimensional image of the surgical area. The second and third incisions are for the surgical arms that map to the surgeons left and right hands. The surgeon sits at a console several feet from the patient and views the surgical area through two lenses. Foot pedals allow the surgeon to rotate and zoom in and out of the camera's picture. The console includes two hand controllers that are linked to instruments inserted into the patient. The surgeon's movements are scaled and duplicated by the robot. Are Robots Safe for Heart Surgery? 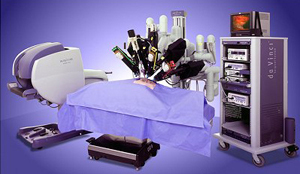 Although commonly referred to as robotic heart surgery, the da Vinci Surgical System is actually more of a computer-enhanced surgical tool than a robot. Nothing is programmed into the machine; instead, all surgeries are done in real time. This means the tools inside the patient only move when the surgeon's hands moves. When the surgeon's hands are still, the robot is still. Although the operating surgeon is stationed at a console several feet away from the patient, a second surgeon remains at the patient's bedside throughout the procedure. The second surgeon changes instruments on the robot and is available to take over for the robot should the need arise. The high-resolution 3-D stereo viewer is designed to provide surgeons with an immersive experience. Unlike conventional approaches, surgical field appears at high-magnification, brilliant color and natural depth of field. This allows the surgeon to dissect nerves accurately with minimal trauma and allows for greater nerve preservation during the operation. To perform a procedure, the surgeon uses the console's master controls to maneuver the patient-side cart's four robotic arms, which securely hold the patented EndoWrist instruments and high-magnification endoscopic camera. These advantages enable better outcomes when operating in confined environments experienced during minimally invasive surgery. Montefiore-Einstein Cardiovascular and Thoracic Surgery Department Chairman, Robert E. Michler, MD was among the first surgeons in the United States to perform minimally invasive robotic heart surgery. In fact, Dr. Michler's work with robots expedited FDA approval of robotic heart surgery for mitral valve repair and coronary artery bypass surgery. Few surgeons have practiced robotic surgery longer. Joining Dr. Michler is Joseph J. DeRose, MD, Director of Minimally Invasive and Robotic Surgery, is another pioneer in robotic heart surgery. He is an expert in mitral valve and atrial fibrillation surgery. Surgeons at the Heart and Vascular Center understand that not everyone who might benefit from robotic heart surgery will feel comfortable with new advances. If patients remain wary about robotic heart surgery after face-to-face discussions with our surgeons, their Montefiore team will discuss traditional heart surgery.